Moroccan Mint Tea is most often a combination of green tea, sugar and fresh mint. This fresh mint is usually a form of spearmint like our Mint the Best. Thought to be a centuries old tradition, some historians believe it is a slightly more "modern" ritual. Indeed it is the making and serving of the tea that is traditional and not necessarily what it is made from. In times past, it has been made from various fresh herbs used singly (like wormwood or mint), with tea (traditionally a dried gunpowder tea from China) or in combination with other fresh herbs (like Lemon Verbena). Dried tea and dried mint are often sold as Moroccan Mint tea and the dried mint is usually a form of peppermint like our Moroccan Mint listed here. The making of the tea is a lengthy process meant to, not only produce a nice cup of hot tea, which by the way is served in glasses, but it also serves as a way to socialize. There are variations of how Moroccan tea is made but it usually starts by rinsing the green tea with a little boiling water. This water is sometimes discarded and sometimes added back in. The tea remains in the pot and sugar is added at a ratio of about 1part tea to 3 parts sugar. Big bunches of fresh mint are added almost as much as the pot can hold. Twisting the mint or tearing it slightly helps to bruise the oils from the tea. Boiling water is added to the top of the pot and the pot is placed over heat to come to a boil. This is then removed from the heat and poured into heat proof glasses. Like all mints, Moroccan Mint, should be confined to a pot. Mints grow better in pots with lots of surface area rather than lots of depth. Mints need to be divided and repotted with fresh soil each spring. 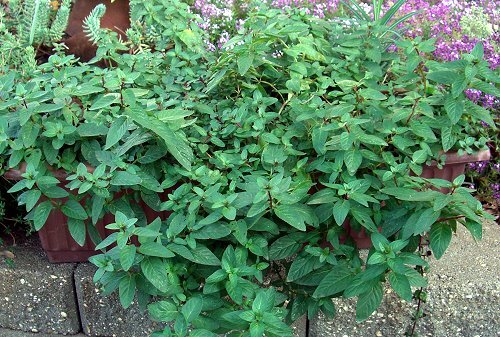 Moroccan Mint makes a great addition to our Tea Herb Garden Six Packs. This plant is often available in plug trays. These trays hold 128 of all the same plant. They are a great low cost way to fill a lot of space. Each cell is 3/4 of inch by an inch. Check here to see if Moroccan Mint Plug Trays are available.